Local food and high standards is key to winning customers down your local. Andy Richardson visits one pub that’s fighting back and doing well. . . In an age of rural pub closures, The Haughmond is bucking the trend. Opening amid little fanfare a few years hence, it’s quietly gone about its business and forged a loyal customer base in rural Shropshire. Located near to Attingham Park, on the outskirts of Shrewsbury, it is all things to all people: a decent village local serving foaming pints of real ale to locals; a decent restaurant that has won two AA rosettes and knocks the spots off a number of competitors in Shrewsbury; a watering hole for local ramblers, bike riders and dog walkers who want to rest weary limbs and recharge and a village shop for people who live nearby and don’t want the hassle of a 10-mile round-trip to the nearest supermarket. Its owners, Martin and Melanie Board, have shown considerable foresight in attracting the widest possible audience: in addition to seven-course tasting menus, thoroughly decent a la carte dinners and sumptuous Sunday lunches, The Haughmond also provides a homely and rustic coffee shop and farmshop where people can relax with coffee and cake, meet friends for a light lunch or take a ‘pedal stop’ while cycling lovely Shropshire routes. It stocks a range of local, fresh and convenience products, local deli meat, vegetables, cheeses and ale, fresh artisan bread, gifts and more. Every credit has been earned as the venue has embedded itself in the local community. Hell, it even has its own hampers for tourists and local businesses. There’s not a box it hasn’t ticked. While such ventures are commendable and show the entrepreneurial flair of the venue’s owners, the real action comes in the dining room. 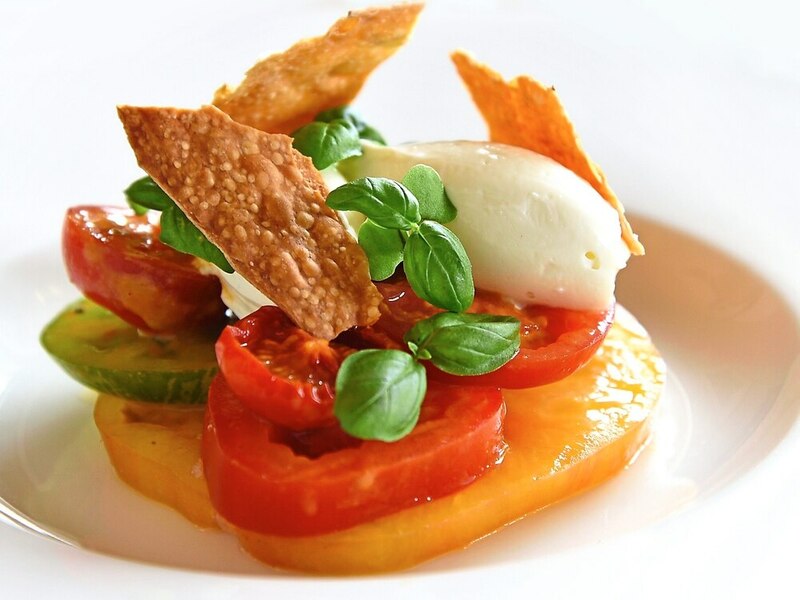 Chef Martin leads a team devoted to local food with good standards of provenance and favours a relatively simple menu that showcases the best of seasonal flavours. When my friend and I called for a midweek supper, service was also exceptional – a young, blonde restaurant manager providing just the right balance between informality and professionalism. Our host was charming, hard-wearing, knowledgeable and extremely friendly and added to the experience. We’d intended to enjoy the venue’s three-course, a la carte offering, which provides a good selection that pleases vegetarians, pescatarians and carnivores alike. But when the waitress came to take our order, we’d been too busy chatting to look at the menu. We asked about the taster – a seven-course smorgasbord that ran the gamut from crab to pigeon via plaice, lamb and passion fruit (though not all at once) – and opted for it. Though we ended up falling just before the final fence, baulking after our sixth course, it was a smart choice and gave us the opportunity to experience the frequent highs of Martin Board’s food. We began with pre-dinner drinks, my friend choosing from a wide selection of gins, before being shown to our table. The dining room was light and airy, tastefully and unremarkably decorated in neutral tones, and there was ample space between us and other guests in the capacious space. We began with bread, which was better than hoped. A delightfully soft focaccia had been doused in olive oil so that the top and bottom was almost crunchy. Drenched in plenty of salt, it was indulgent and delicious. A small brown loaf, topped with sesame seeds, was also pleasing. The opening course was a taste of summer. 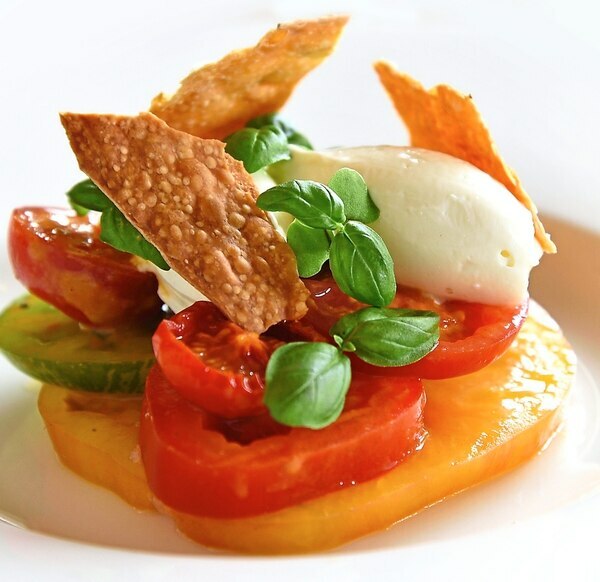 A heritage tomato salad had two small quenelles of light and deliciously mild cheese mousse and was garnished with pea fronds and basil leaves. It was delicious. There’s a lot to be said for letter great flavours speak up for themselves and the simply and elegantly constructed dish was delicious. The tomatoes were so fresh that they almost tasted like little sweets and their rainbow colours made for attractive as well as delicious food. Next came a crab and pea dish, comprising a small stack of white crab meat that had been filled with fresh garden peas. 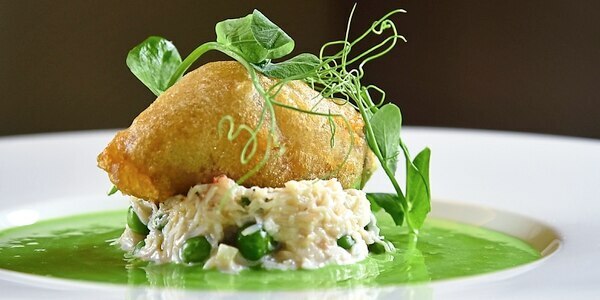 It was finished with a beignet of brown crab meat and a pea velouté. The velouté was delicious; swirls of olive oil topped it and added body and depth to the sweet, smooth soup. The beignet was delightfully crisp though the abundance of peas in the crab stack were perhaps unnecessary. An impressive meat starter followed, featuring a small, homemade sausage roll in rich, buttery pastry and two slithers of pan fried pigeon breast that were decadently rare and had been perfectly rested. Dots of black pudding purée and parmesan purée added colour, complementary texture and bags and bags of flavour. It was a pleasantly thought through dish. Considerable skill was evident in the fish course: a small square of beautifully cooked plaice whose skin had been crisped brilliantly in the pan. A swish of red pepper purée and tiny quenelle of olive tapenade made for delicious eating and my friend and I purred our way through it. 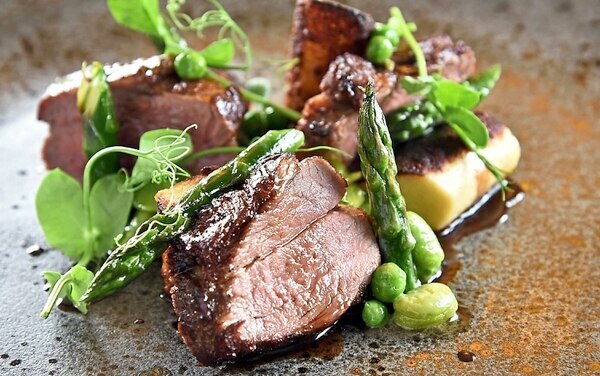 Better was to follow, however, as a lamb rump with garlic gnocchi, a fricassee of broad beans, peas and asparagus tops and an acidulated sauce vierge followed. The vierge was probably not necessary, an unctuous, umami-rich jus was more than enough to elevate the dish. But, boy oh boy, what cooking. The lamb rump was melt-in-the-mouth tender. Brilliant scorched on the outside, so that it had caramel flavours and hints of bitterness, it had been well rested so that it was tender and moist on the plate. The gnocchi was a clever accompaniment and the fricassee was a taste of late spring. Wonderful. The taster menu provided for two desserts, though we instead opted to eat one each. My friend ate a delightful passion fruit dish, which comprised a frozen element that was part semi-freddo, part-Italian meringue. Soft, filled with sweet, tart flavour and as light as a spendthrift’s wallet, it sang like an angel. Salted caramel ice cream, peanut brittle and small pieces of homemade biscuit finished a busy and filling dish. 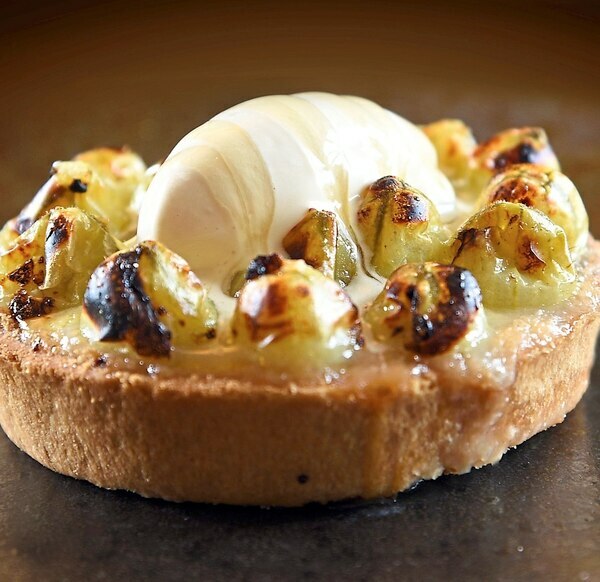 My gooseberry tart was similarly good. The crème fraîche ice cream provided a contrast to the sharp berries while the pastry snapped like glass beneath a house brick. It was a good way to end. 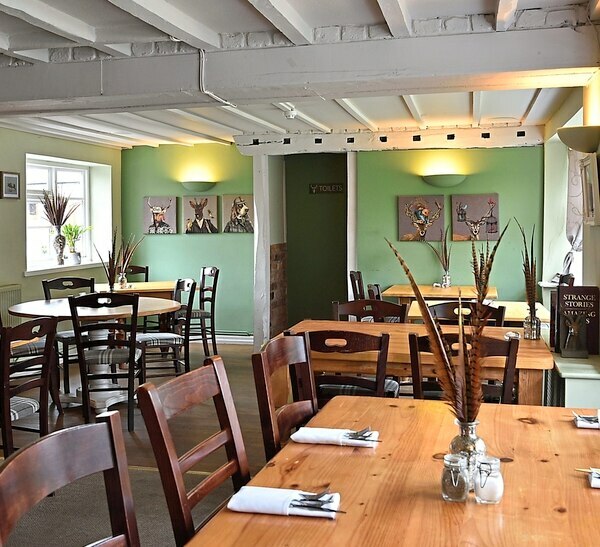 The Haughmond earns its 4.5/5 rating for it is among the better restaurants in the county. 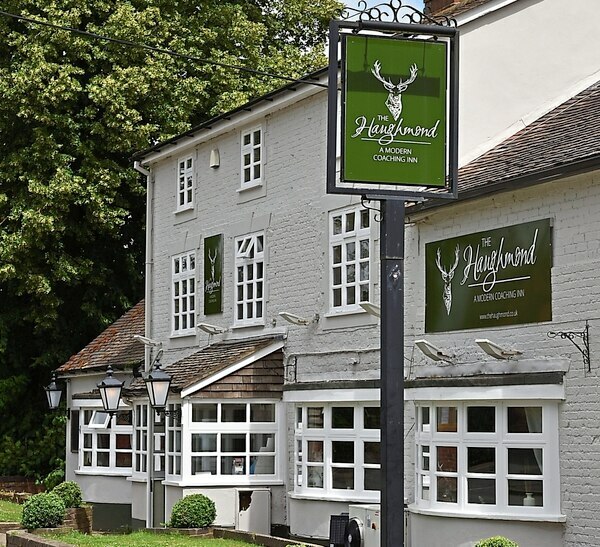 A sense of perspective means we’re not looking at the best thing since Ludlow’s Class of 2000 – The Haughmond isn’t going to earn Michelin stars or third rosettes any time soon. Instead it’s offering relatively simple but well executed dishes that emphasise local flavour. Add that to a pleasant dining room and first class service and it’s found a recipe for success.